You are getting married and want to commemorate your marriage in a special way that is different from how your mom and dad did so. You and your spouse want wedding bands, but not the usual silver or gold bands chosen by so many people. You want titanium wedding bands that express the strength of your love in a non-traditional manner. There are many other benefits to a titanium wedding band. The first benefit is that titanium is different. It can be shiny or brushed in finish, but it offers a statement to the world that you and your spouse do not follow the crowd. You think differently and want to represent a new generation in marriage. While some of your friends go for gold or silver, your statement is that marriage is about strength: the strength of each of you as individuals and the strength of your union together. Gold and silver just will not cut it for this kind of statement. The second benefit of titanium wedding bands is that they will not react with your skin in the way that gold and silver rings can. 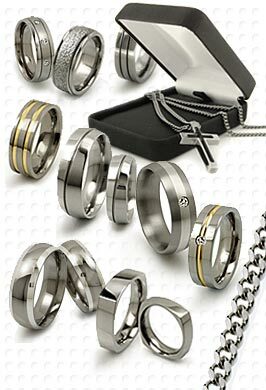 Usually, the offending metal in both gold and silver rings is nickel, which is used to harden the precious metals. Nickel is no necessary in titanium since the metal is already very hard. As the wearer of the ring, this will be a relief because you can keep it on your finger all of the time without discomfort. And, because the metal is so hard, you do not have to remove your titanium wedding band when cleaning dishes or performing other typical, household activities. In fact, if you work in the manual trades, you can engage in most of your work activities without fear of harming your ring. 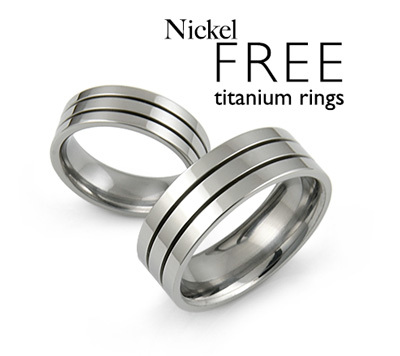 The third benefit of titanium wedding bands is their affordability. Though they can be polished to a brilliant appearance, their cost is a fraction of the equivalent gold ring. In addition, the inside can be inscribed with a message about your love and you need not worry that the inscription will rub off after many years. Because young couples are generally just starting out in life, they need to manage their money closely and these rings are priced within easy reach. As you look at wedding rings and at the statement that you want to make to the world about your love, consider the options available in titanium. A titanium wedding band offers so many benefits.